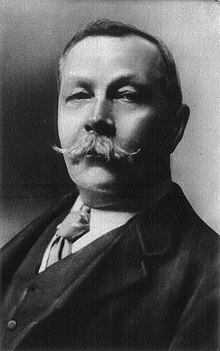 About the Book: "The Adventure of the Second Stain", one of the 56 Sherlock Holmes short stories written by British author Sir Arthur Conan Doyle, is one of 13 stories in the cycle collected as The Return of Sherlock Holmes. 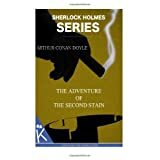 Doyle ranked "The Adventure of the Second Stain" eighth in his list of his twelve favorite Holmes stories. My Review: In this story, Lord Bellinger, the Prime Minister, and Trelawney Hope, the Secretary of State for European Affairs, come to Holmes in the matter of a document stolen from Hope's dispatch box, which he kept at home in Whitehall Terrace when not at work. If divulged, this document could bring about very dire consequences for all Europe, even war. They are loath to tell Holmes at first the exact nature of the document's contents, but when Holmes declines to take on their case, they tell him that it was a rather injudicious letter from a foreign potentate. It disappeared from the dispatch box one evening when Hope's wife was out at the theater for four hours. No-one in the house knew about the document, not even the Secretary's wife, with whom he will not discuss his work. None of the servants could have guessed what was in the box. Holmes decides to begin with some spies known to him, and is then astonished to hear from Dr. Watson that one of those that he names has been murdered. Eduardo Lucas of Godolphin Street, near Whitehall, was stabbed to death at his house last night. Holmes is sure that this is beyond coincidence. Before Holmes has a chance to act, another piece of the puzzle arrives at 221B Baker Street in the form of Lady Hilda Trelawney Hope, the European Secretary's wife. She asks Holmes about the stolen document's contents, saying that it is in her husband's best interest for her to know. Holmes will only reveal that there would be very unfortunate consequences if the document were not found. Holmes reads terror in Lady Hilda's eyes. Lady Hilda also begs Holmes to tell her husband nothing of her visit. Holmes's spy hunt does not go well. It lasts days without result. As for the murder, the police arrest Mitton, Lucas's valet, but soon release him as he has a solid alibi. Four days after the murder, a newspaper report from Paris connects Madame Henri Fournaye to Lucas's death. A woman matching her description was seen in London, where Mme Fournaye has recently been. She is, it seems, Lucas's wife, Eduardo Lucas and Henri Fournaye having been the same person, as established by photographs. She is of no use as a witness, however, as she has gone insane. Inspector Lestrade calls Holmes to the murder scene to examine something odd. Lucas bled over a drugget, and the blood soaked through it, but curiously, there is no bloodstain on the floor under the drugget. However, there is one under the opposite edge of the carpet. It can only mean that the constable guarding the crime scene has been foolish enough to let someone in, and leave them alone while they moved things in the room, including the carpet. Holmes tells Lestrade to take the constable to a back room and obtain a confession, which he does, vigorously. While Lestrade is remonstrating with his wayward constable, and therefore cannot learn anything about the other investigation involving the document, Holmes pulls the unfastened carpet aside and quickly finds a hiding place in the floor, but it is empty. Lestrade and the constable come back, and the latter tells Holmes that the unauthorized visitor was a young woman. She apparently fainted at the sight of the blood, and the constable then actually went out to get some brandy to revive her, but she had left before he got back. As Holmes is leaving Lucas's house, he shows the constable a photograph, and he recognizes it as the visitor. Holmes now knows where the stolen document is, but not why it was stolen. He goes to the Hope household and confronts Lady Hilda with the evidence. At first, she denies everything, but is forced to admit her wrongdoing under threat of certain scandal. She was a blackmail victim. Eduardo Lucas had got hold of a compromising letter written by Lady Hilda years earlier, and demanded the contents of her husband's dispatch box for the return thereof (an unnamed spy within her husband's own office had made Lucas aware of the document). She went to his house to do the business when, as it happens, his wife from Paris showed up and confronted him about his affair, believing that Lady Hilda was his mistress. Lady Hilda hurriedly left. She returned, however, to fetch the stolen document after her visit to Holmes convinced her that she needed to do this. She hands the document to Holmes. Her only problem is how to return it. Holmes suggests putting it back in the dispatch box using Lady Hilda's duplicate key. They do this, and when Hope arrives back home with the Prime Minister, Holmes pretends to believe that the evidence has convinced him that the document must still be in the box. It is soon found, and Hope rejoices that it was only a mistake. In this way, the lost document is restored without Lady Hilda's part in the affair being revealed - though at the possible price of making her husband look a bit stupid. The Prime Minister, however, is no fool. He can see that there is an underlying story, but Holmes simply responds, "We also have our diplomatic secrets." Nothing is mentioned furthermore about the unnamed spy in the office of the European Secretary of State. Another excellent plot! 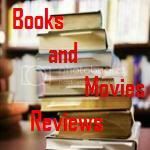 I recommend this book to all readers who enjoy a well written mystery.